Journal of Multidisciplinary Academic Tourism (JOMAT) is an explicitly international and multidisciplinary peer-reviewed scientific journal founded in 2016. 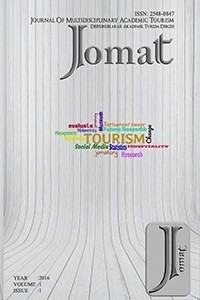 JOMAT aims to publish both empirically and theoretically based articles which advance and foster knowledge of tourism and research that explores one or more of the economic, social, cultural, political, organizational, marketing, management or environmental aspects of the subject. We are also trying to give a new perspective to tourism-related activities. The journal encourages short commentaries and rejoinders and provides a rapid turnaround of submissions. In addition to regular length submissions, the journal also welcomes extended peer-reviewed papers on a single topic that combines detailed literature reviews with substantive empirical research and policy analysis. We also welcome supplementary material in the form of video, audio, photographs and additional supplementary about data, not included in the paper. The journal publishes Main Papers, Book Reviews, Review Essays and occasional Opinion Pieces. Book reviews and Opinion Pieces are by invitation only. This journal is abstracted and indexed by CAB Abstract, SOBIAD, CrossRef, Google Scholar, ASOS Index. Jomat is licensed under Creative Commons Attribution-Noncommercial-Derivable 4.0 International License.